Please note that this article was an April Fools day joke and is not meant to be taken seriously. You start the game with a score of zero. This is a very humbling move by the creator, as starting with zero means you've accomplished nothing thusfar. This is soon to be remedied, though. With your trusty mouse or trackpad in hand, you mouse over Twilight Sparkle, and left click. The score advances by one. You click once again. You now have two points. Your goal is now clear: to get as many points as possible. All aspects of this game are very well done. The minimalistic graphics truly capture this game's spirit. The music, according to the author, is completely original. The tune is very catchy, and might I add, the voiced bit at the beginning mimics the voice acting of the Cutie Mark Crusaders perfectly. This is the type of song which could easily be found in the show itself. The mechanics are flawless - Twilight Sparkle's hitbox is completely precise - click on her, and you get a point, but click one pixel away from her, and get no points. This type of professionalism I found very refreshing in this day and age. The game's engine was written specifically for the game, too. The anonymous author calls it "Game Maker." Maybe the author can be convinced to share that engine with everyone else, as it seems quite versatile. 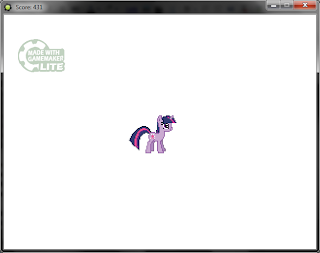 The final point of merit for this game is the use of Twilight Sparkle, the show's best pony. The author expects spinoffs to be made for every character, but wanted the original game to star everyone's favorite purple unicorn. Several months of work have obviously paid off with "Click the Twilight Sparkle," and I expect fanart, perhaps even a fanfic or two, to be rolling off the presses really soon. This marks the first time that Equestria Gaming has brought out "The Celestia Grade." This game is indistinguishable from a professional one, and for this reason, I dub it the best pony game in history. Have fun playing, and be sure to post your high scores in the comments (pics or it didn't happen).